← Did you hear about the latest phobia? Tourists, tourists, tourists, when will they stop coming? This past month is the longest I’ve gone in 10 years without producing a blog. I have a good excuse for June, namely, that my husband and I took a three-week trip and returned tired and jet-lagged, sneezing and coughing. But for much of May, I stayed away because I’d run out of ideas, one pitfall of choosing early on to write on somewhat random topics instead of focusing on one, such as fitness, fast cars, or cute pets. But since I’m not an expert on anything in particular, I’ve enjoyed reading and writing on subjects that caught my eye in newspapers, magazines and books, or ones inspired by conversations, lectures and new experiences. I’m thankful I have come up with a topic, maybe two or three, but taking the first step to restart is daunting. So far this week, I’ve managed to avoid it by ironing the washed clothes I wore on the trip, weeding much of my yard, and taking naps. However, as of today I’m closing my eyes to any more avenues of escape…except maybe to the kitchen where five chocolate bars, the Sirens of Finland, are calling. 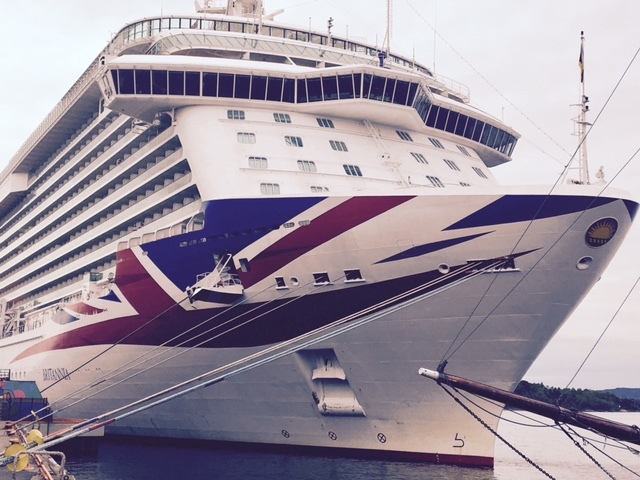 Our trip took us through parts of Denmark and much of central Norway and ended in Stockholm, Sweden. The room in our first hotel in Copenhagen had a tiny wastebasket with dividers that cut it into thirds, one part for paper, one for compostable materials, and one for garbage. This got me thinking about the implications of tourism for many countries and for the environment. I thought about it every time we entered a port city or fjord in which large cruise ships (carrying as many as 4,000 passengers) belched out so many tourists that popular sites were almost inaccessible to them and to anyone else. Tour guides have apps on their phones to tell them how many ships and how many passengers are in town, so they can stay away from the most favored places at certain times of the day. We were part of a group of 25 that traveled mostly by bus (and ferry and train), which also means we affected the environments we passed through, but on a much smaller scale. 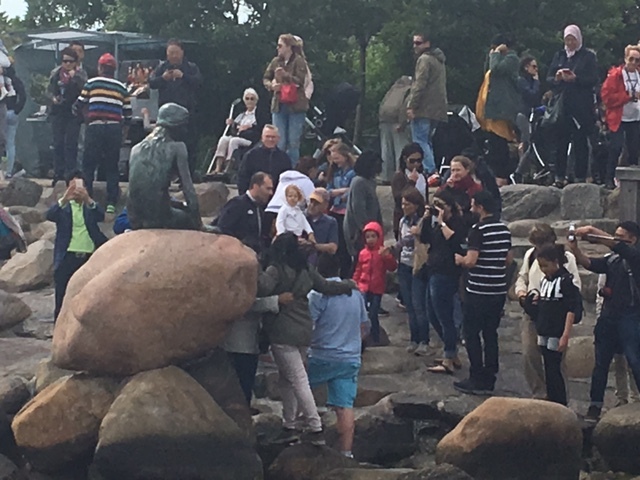 One of our first stops in Copenhagen was at the site of the Little Mermaid, the bronze statue inspired by the Hans Christian Anderson fairytale. (You can see her without tourists at the link above.) Bus parking lots overflowed, traffic jams abounded and the throng made it difficult to even see the statue (which our guide said is a disappointment to many, because at 4.1 feet tall the Little Mermaid was just that, little). And surely the Viking Ships Museum had more visitors on the day we stopped in than the number of Vikings who inhabited the area over the course of several centuries. Still, no matter where I travel I imagine that organizations like our local Chambers of Commerce and politicians all want tourist dollars for their cities. As it turns out, some do and some don’t. Of the 20 places most reliant on tourist dollars for their continued existence, all but a few are islands, including Bermuda, Aruba, St. Lucia, and the U.S. Virgin Islands. The countries of Spain, Portugal, Thailand, Mexico and parts of Central America, are among those locales that earn up to 45 percent of their GDP (Gross Domestic Product) from tourism. In contrast, there are also countries that are re-considering the consequences of boosting tourism any further. According to Conde Nast Traveler, among those destinations that “have proposed—or put into place—measures restricting the annual number of visitors” are Santorini, Cinque Terre, Norway, Venice, Zion National Park, Barcelona, Iceland, the Galapagos, Machu Picchu, Mt. Everest, and Antarctica, some because the locals are getting fed up, but many because building new infrastructure to accommodate more tourists would threaten the natural environment. Also, there are countries that don’t have to worry about setting limits on tourists because no one wants to go there. Some lack amenities, others are hard to get to and others are too dangerous. This list of 25 includes North Korea, Afghanistan, Turkmenistan, and Somalia. Another reason the remaining 21 countries on the list might lack visitors is that no one who has not made a career of studying an atlas has ever heard of them. I’ve done it. Blog complete. Now I hear the chocolate in the kitchen calling my name. This entry was posted in current events/themes, travel. Bookmark the permalink. 8 Responses to Tourists, tourists, tourists, when will they stop coming? Glad you had a great trip to the Scandinavian area. Enjoy your chocolates before they melt!! Wonderful to read a blog from you once again, always a bit of “food for thought”. It is a challenge to find the right time to travel to miss the majority of tourists and I suppose over time some of these unknown destinations around the world you mentioned will be born into the world of travel whether they like it or not. Sad, but as learners we have an insatiable curiosity. Now on to the next trip. Welcome home, Ann. Thanks, Dar. it is a dilemma. I don’t plan to stay home, but I do want to travel as wisely as possible in the future. I am thankful that I did my ‘touring’ mostly during the 70s and 80s, before the most appealing countries became overcrowded with tourists. Tourists seemed to be more polite and thoughtful in those days, more aware that they were infringing on other peoples’ space. We have an abundance of tourists coming here every summer and, for the most part, they are fine, if it were not for the ‘crush’ of people. There are areas of our city that I stay away from all summer to avoid them! If only…But I think the crushes are here to stay. Years ago it was possible to walk up to a museum or railway ticket office in Europe, buy your ticket, and be on your way. No longer. Many museums and attractions are booked solid by tour companies and people reserving months in advance online. The last time I tried just walking into a train station in Amsterdam and buying a ticket to Germany it took several hours – and that was twenty years ago. I’ve learned to like tours for the information I get from the guides and the organization that takes place before my participation. No ticket lines and audio systems ensure that you actually hear the guide without having to stay by her side. Still, the crowds can get overwhelming. If you travel much you know which groups will take over any site, monopolizing the “view.” I’ve learned to not only take photos of places filled with tourists, but I also now take pictures of tourists posing for (multiple) selfies in front of the things everyone wants in their photos. We saw the tourists posing for multiple selfies in front of the Mona Lisa, never did get close to the painting.